I first came to know of Deepak Dalal about a decade ago when I was looking for information on the Moghiyas. Moghiyas are a gatherer-hunter community. He was quick to reply to my request as also send me a copy of his book – The Ranthambore Adventure. Not only did I enjoy reading the book, it also made me aware of two aspects about the author. One that he happily got into the depths for his books; there was then very little available on the community despite ample work on wild life conservation taking place in and around the landscape, and the other that he knew his words well. Stories remain amongst the best ways to teach children how to cultivate empathy and mutual respect. As young readers, the children are learning that life could have ups and downs; that they might make you feel good or not so good; and that you could get through most of the difficult stuff with kindness, imagination, and empathy. “What happened?” is a key question in children’s books. They are strong on plots; things happen quickly; they have consequences. The story in Talon the Falcon has an engaging flow. The author builds the suspense and makes the reader look forward to what happens next. Similarly for the details or etching out of the scenes. The manner in which words are placed together helps the reader visualize the species the story talks about. • Squirrel gazed down at the human den. • Heart started to hammer woodpecker-like in his chest. • They are monster birds, crueller than even monitor lizards. • All birds sing the same song; have the same feeling against being caged. • Falcon’s sorrow is worse than even death. The caged bird sung a sad song which brought out how painful, sad and depressing it is for birds who love flying in the skies to be in a cage. It is a full page song and talks of sadness on account of being away from sunlight, not being able to use the wings, not feeling the clouds and more. The design of the book gave me a pleasant feel. The colour of the pages changes with the time of the day. Each species has a name, the first word in the book is a name, and they react to situations like humans do. All of this makes reading more fun. Each character has a name. It is not just a bird or even a sparrow. The book, for example, begins with “Shikar, the squirrel, rested in his nest, high above the ground, in the old jacaranda tree”. This I understand adds positively to the book. What I loved more was the need for birds to have wings – to be free to fly. The need for all of us to be free – to live our lives. The message this book conveys is clear – birds, irrespective of the species, should not be in cages. Admirably, across the pages, the author has managed to remain non-preachy. The author has presented a realistic picture of humans. He even refrains from painting children in the proverbial ‘white’ when he refers to Chintu as ‘the awful human youngster’. Also the other species refer to humans as being worse than falcons and cats. Bringing human beings down from their pedestal is a theme found even in Arefa Tehsin’s books. This is crucial; there is little point in presenting a wrong picture of their own species to children. There is a lovely footnote on sky birds. Did I miss the one on great bill? 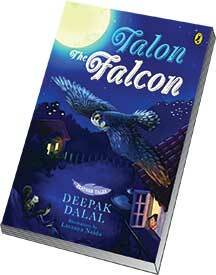 Talon the Falcon is a novel for children but there are many teaching points you can draw from this book. Ask your students to talk with family members and find out which species have increased or decreased in and around their homes over the past decade. Can they find out why? Let them observe the birds and animals they see in and around their homes. What do they do? Select a tree (could be on the school campus) and observe it at regular intervals over a long period to understand the changes on account of seasons or even time of the day. Write a few lines on each of the paintings. Use paintings in the book to write a story of your own. The book has a lot of illustrations – credited to Lavanya Naidu, paintings could be an incorrect term. One of them depicts the falcon in cage – close-up while another shows the squirrel looking at it from a distance. There is one which shows different species of birds enjoying at the fountain while the final page has an empty and open cage. Seek more information on the species mentioned in the book. Read up and find out if the species are as mentioned in the book – e.g. is the sunbird short-sighted? Does it have a hearing problem? Select a few difficult words from the book and discuss what alternative words could have been used. Have a reading session with different students playing different characters and trying to bring out their sounds and emotions. *The Hindu 20th November, 2016. The author enjoys exploring nature education and blogs at http://nimesh-ved.blogspot.com/. He can be reached at nimesh.explore@gmail.com.